LEBANON, Mo. — The principal of a high school in Missouri recently circumvented a ban on graduation prayer by speaking about the history of God in public life during his recent address to graduates. 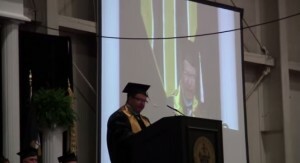 Lebanon High School Principal Kevin Lowery exhorted students during the May 23rd commencement ceremony at the Cowan Civil Center to remember that “God is still important” in the face of being prohibited to pray during the event. “And even though God is reflected in the very fabric of our nation, we are told that it is inappropriate and even illegal to mention God at high school graduations, let alone say a prayer,” he continued. Lowery then decried that it “would not be politically correct” for him to lead the room in prayer as he asked those gathered for a moment of silence. “[J]ust in case you’re interested, during my moment of silence, I gave thanks to God for these great students, their parents, their teachers, and for this community,” he said, proceeding to present the contents of his silent prayer. The room then broke into applause and cheers from those who understood how Lowery circumvented the ban on graduation prayer. The civic center was then filled with applause for the next several seconds. While at least one prominent atheist who learned of Lowery’s speech has contacted the district to complain about his references to God, others have expressed appreciation for the principal’s boldness. “Good for him,” one commenter named Trent stated. “Congress did not establish a national church like the Church of England in this speech, so no law was broken, despite what the … atheists foaming at the mouth have to say about it.